StageofLife.com releases its monthly, educational teen trend report. This month's topic tackled the pending Presidential election. Over 4,700 teens and college students visited the StageofLife.com monthly student survey and writing contest page. The below report shares the results from the students visiting StageofLife.com and participating in the political survey and national essay contest. 32% of teens have had an argument about politics with their parents...the heated debates centering around gay marriage, abortion or healthcare. While it's assumed by the Obama and Romney campaigns which way many niche audiences will vote, the candidates may be interested to know that over half (55%) of teen and college bloggers will (or would) vote for President Obama verses 23.6% for Governor Romney, as reported by StageofLife.com, a non-partisan, digital literacy, educational resource, in its most recently completed national student survey and writing contest. --1 out of 3 students did not realize there are other candidates other than Obama and Romney running for President, i.e. Libertarian, Green Party, etc. --70% of teens indicated their parents talk freely about politics at home. --40% of teens either "completely agree" or "agree on the major political issues" with their parents compared to less than 7% of teens who say they do not agree with their parents politically ("at all" or "on major issues"). --14% of students have no idea of their parents' political viewpoints. --32% of teens have had an argument about politics with their parents. The top three most cited topics of the argument centered on gay marriage, abortion, and healthcare. More than a dozen other topics were volunteered by the students too. --Nearly 50% of all teens said that one (or both) of their parents took them to the local polling center when they were in elementary school to experience the voting process. --The majority of students (53%) feel they have a political voice in this country. The political survey results stemmed from StageofLife.com's monthly, national writing contest. In addition to providing links to resources that help college students and teens get involved politically, the writing prompt asked students to share their political “passion issue” and indicate which candidate best supported their issue. Over 4,700 teenagers visited Stage of Life's writing contest page, 140 completed the political survey, and 75 submitted a qualifying 500 word essay sharing their political passion issue. In their essays, teens addressed political topics ranging from the support of Israel, the economy, gay marriage, women's rights, education, immigration, job growth, healthcare, national security and more. The winning student essays tackled two very different political issues. The 1st place Pro-Obama essay, “Grateful for Homework? The Issue of Education in the 2012 Presidential Election,” puts Obama in a more positive light on educational opportunities for teens while on the other side of the aisle, the winning Pro-Romney essay, “A Taxing Workday,” paints Governor Romney favorably for wanting to reduce taxes. Both essays won the majority of votes from the 26 Editors and staff who facilitate the national writing contest for StageofLife.com each month. For October, in a month dominated by the NFL season and the World Series, StageofLife.com's current national writing prompt asks students to share a story about how sports have shaped family traditions (positively or negatively). Essays must be submitted to StageofLife.com by midnight PST on October 31st, 2012. StageofLife.com is a privately held company founded in 2009 as a free educational resource with a digital literacy mission to encourage life-long readers and writers through its interactive blogging community. 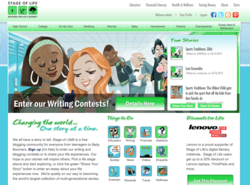 With over 5 million uploaded words and thousands of submitted essays, it has become one of the world's largest collection of multi-genational stories as it features monthly writing contests, free educational resources, Language Arts lesson plans, writing prompts, statistics, and more for each life stage and generation, from teens to Baby Boomers.